Picture yourself sitting tall and confident. Go as far as your heart’s desires and time allows. Turn dream into reality with a horse “whose soul is in his task”, a rewarding partner, a Kaiserbred. The Kaiser family has been breeding horses over forty years. In the late 70's they began to specialize in sporthorses, with emphasis on dressage. Margaret realized a demand for mounts with three essential qualities: athletic conformation, gaits, & a sensible work ethic. Thus they focused on producing horses with the traits needed to succeed in top competition and the temperament to be compatible with amateurs. Breed type to type, cross individuals with similar characteristics, not extreme differences. Breeding Horses is not like mixing paint, you can't mix black with white and expect grey." The accomplishments of Forrest Hill’s Percherons and crossbreds have been recognized nationwide for many years. 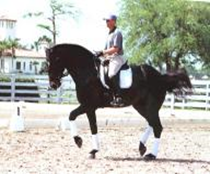 FHF Kaiserbreds are competitive with European and American Warmbloods of all breeds. 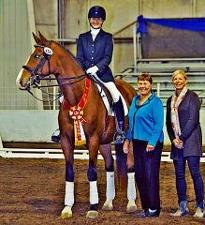 In 2013 they continued their winning ways at the inaugural USDF Dressage Nationals. Few breeders & trainers can boast raising, training and successfully competing homebreds to Grand Prix, especially by their students!! The slogan "Willing Minds & Able Bodies" is a literal description of the horses the Kaisers strive to raise, train and sell. 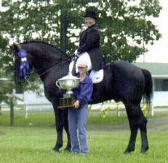 Cottonwood Flame, a 1988 black Percheron stallion, was Forrest Hill's premier Percheron foundation sire and F.E.I. (International) Level champion. Acquired at 6 mos. of age, Cottonwood Flame, (aka. 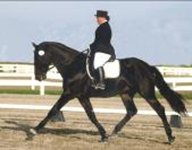 "Woody") was exhibited and trained by Jennifer Kaiser. From 1992-2001, Woody's consistent and powerful performances annually earned many championships and titles at every level. Portmanteau, aka “Porter” a 1997 son of Cottonwood Flame, continues his sire’s winning tradition. Porter’s career began with Champion/High Scoring horse in his 2nd competition ever. Scoring thru 78.65% he continued to earned championships & an IDS Highpoint Horse of the year award. He has successfully shown thru 3rd level and is now schooling FEI after recovering from a breeding injury. We hope to see him back in competition in 2014. Rouge Chanteur was our foundation thoroughbred sire. Bred in Canada he possessed every trait we sought. He proved to be an outstanding sire. Rouge was an exceptionally correct and kind stallion. He passed his characteristics to many offspring. His influence has continued through three generations. Today Forrest Hill is a leader in the production of Percheron, Throughbred, and Warmblood sporthorse crosses. Their success and popularity has resulted in the designation,“Kaiserbreds”. This label distinguishes Forrest Hill’s uniform blend of select draft, thoroughbred and warmblood lines. Proponents of Kaiserbreds value their desirable traits and proven history of achievement. Select Percherons, Thoroughbreds and Warmbloods with structurally correct frames, hindquarters, forward powerful gaits, and willing work attitudes were crossed. These foundation mares and sires are the source of their breeding program’s success.